As you enjoy your cup of Joe, imagine 2.5 billion cups of coffee being consumed around the globe in the next 24 hours. No wonder coffee is one of the world’s largest commodities. Coffee production methods are hugely important for the well-being of farmers and the environment in developing areas like Central and South America, Africa, and Indonesia, where much of the world’s coffee is grown. In many places, the environment has suffered, and fluctuating market prices have taken a toll on farmers who can’t support their families. The good part? Your coffee choice does make a difference. 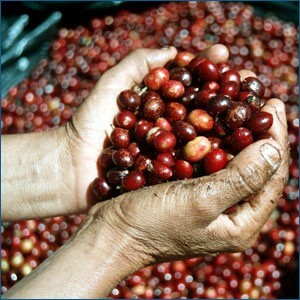 A Fair Trade Certified label ensures the farmers who grew the coffee beans were paid at least a guaranteed minimum “fair trade price.” Participating farmers typically belong to co-ops that sell the coffee themselves and provide credit against future sales to keep farmers out of debt. Technical assistance is provided for sustainable and organic farming practices, and in many cases, farmers form long-term relationships that bring commercial stability to their families and communities. These co-ops often provide other social benefits to their members as well, such as access to health care and opportunities for advanced education. Today, more than 100 U.S.-based companies offer Fair Trade-certified coffee, which is often also Certified Organic and shade-grown. Coffee plants prefer cool, moist environments, and the lush canopy of old-growth shade trees is the perfect provider. But industrial coffee production has introduced modified coffee plants that will grow on sunny plantations, and native forest is cleared to make way for their cultivation. This results in increased erosion and dependence on chemical fertilizers, as well as the destruction of natural wildlife habitats. To ensure that your coffee is grown in a way that preserves the forest, look for certification by the Smithsonian’s Rainforest Alliance. Based in Costa Rica, this group upholds standards for wildlife conservation and workers’ conditions. The Smithsonian Migratory Bird Center also provides a Bird-Friendly coffee seal that shows the coffee is shade-grown (protecting the habitats of migratory birds) and processed without synthetic chemicals.